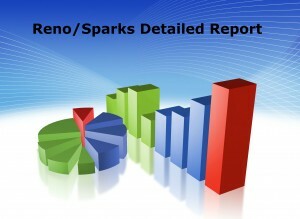 The Reno/Sparks Association of Realtors released their February 2012 market reports. The full report can be viewed by clicking on the picture to the right. Here are a few snippets for those that don’t have any time to read it. The median sales price rose from $135,000 in January of 2012 to $145,000 in February of 2012. As of February 29th, there were 5.4 months of inventory. Inching closer to a seller’s market as a whole. Properties under $200,000 have less than 5 months of inventory. Making that price range a seller’s market. 453 properties sold in February with 339 being under $200,000. Of those sales 29% had no special condition of sale (regular sale), 42% were REO, 28% were short sales, and 1% were court approvals or “other” sales. For more information on the Reno/Sparks real estate market feel free to contact Ricky at (775) 750-1437 or Ricky@Resnv.com. Posted in Market Update and tagged reno home buyer information, reno real estate market report, reno realtor, sparks real estate market report. ← Using Your Wedding Registry To Buy A Home?